It was while we were all gathered around our dinner table as a family one night, somewhere around the 3rd full week of May (2015), that we made the spontaneous decision to not collect some of our chicken eggs in one nesting box, and see if any of the hens would get broody, and naturally hatch them to chicks. 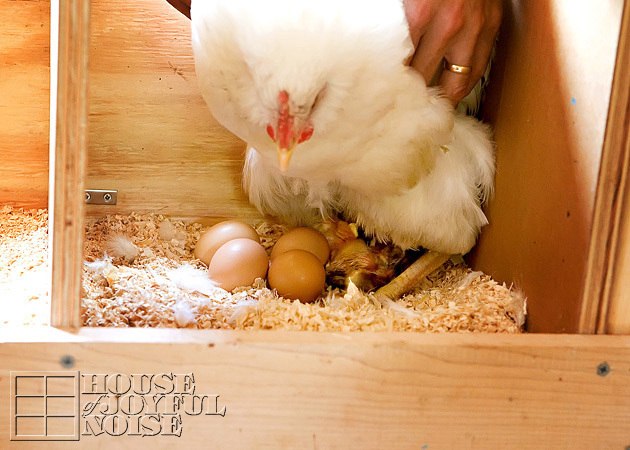 The next day, and the day following that, we left a total of seven eggs in one nesting box, for them to care for. For any newcomers here, we should note that our original flock are all pure breeds, and each of our 6 chickens are a different breed. So we knew that any new chicks that hatched would be part Welsummer (because we only have one rooster), and part one of the other hen breeds. (Also known as ‘barnyard mixes’.) It was going to be fun to try and figure out whose was whose, if any hatched! 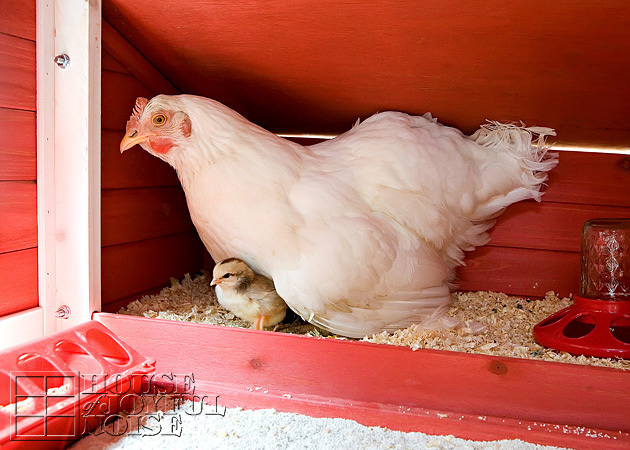 It was Plymouth, our White Plymouth Rock, that stepped up to the plate….errr, nesting box, first, and took on the role of Mama hen. 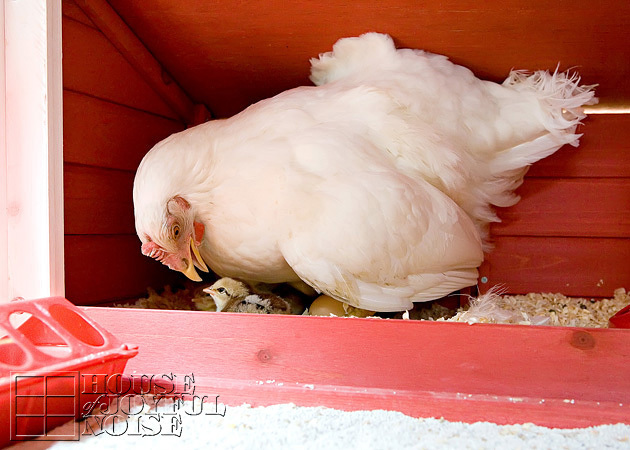 She was so completely committed to caring for those eggs, and not leaving them, that we had to lift her out daily, and put her out in the big run, to go eat, drink and potty. It was really only then, that she’d take no more than 30 minutes, to do those things, recharge, and maybe sneak in a good dust bath. And then it was right back to her volunteer duties. The mothering instinct obviously comes quite easily to her. We started with 7 eggs, because we assumed not all would develop or make it, and so we’d end up with 2 or 3, which is all we were really hoping for right now. 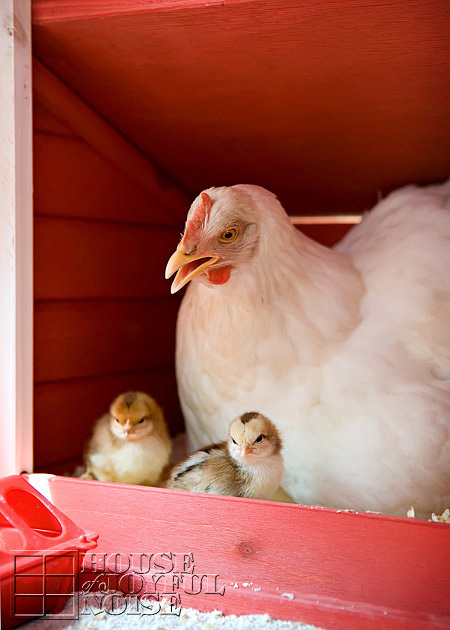 We didn’t know that chickens have a better natural hatch rate, than artificial incubation, as we had done before. So when we candled all of the eggs once, at day 10, and saw veins and a dark moving form in every single one, two things happened. With candling each egg, and seeing so much life in each one, it got real! There was no going back! * NOTE: If you aren’t aware, I have had a broken ankle, and have barely been able to get around. And suddenly, I felt that mother instinct come on, and worried about all of the details. But having had the broken ankle for many weeks, was WHY I said yes to the kids about letting chicks hatch, in the first place. Not being able to drive, or do much else for the kids myself, I knew letting the chickens hatch eggs, was going to be a great new excitement for them! And it sure has been. It all worked out. 2. Secondly, we all began to fall in love with each one of them. As with all signs of a new life beginning, it’s a beautiful thing to witness. 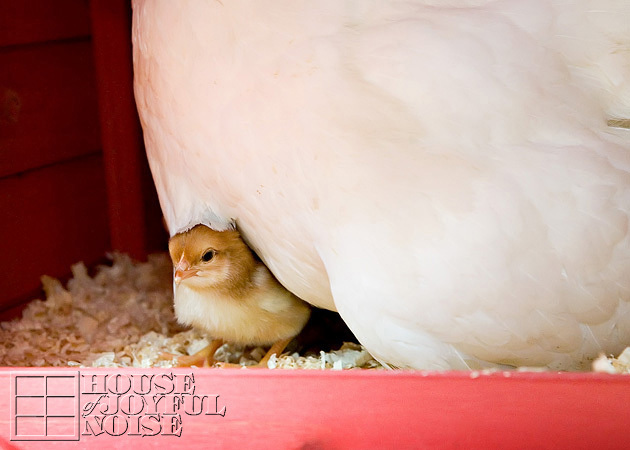 We love our rooster and hens, and each one of these were their babies! There was a sentimental connection to each one of them, already. A concern they were going to have a smooth hatch, and be healthy. 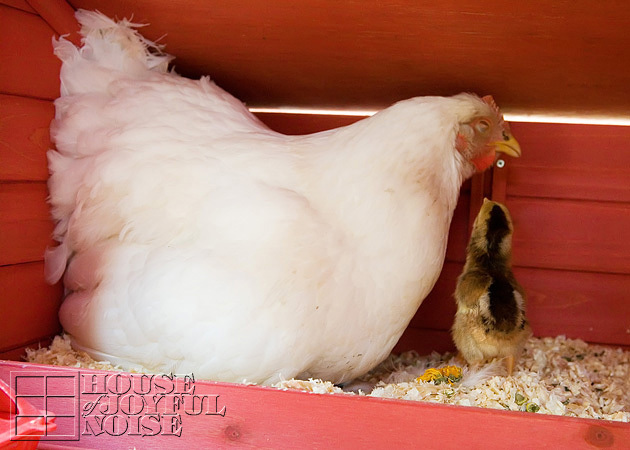 That’s why we were so sad when, one egg, and then another, was broken in the nesting box. 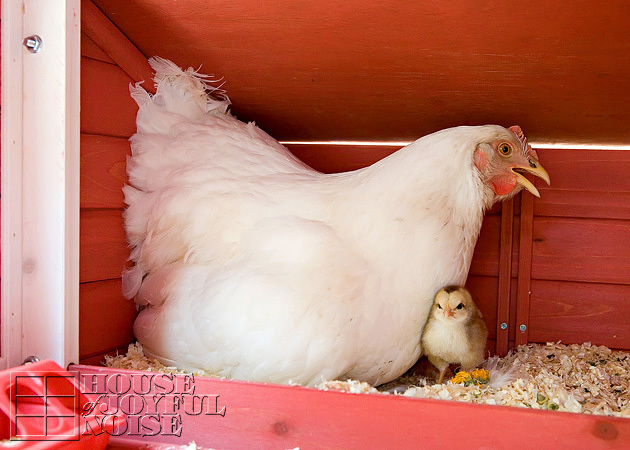 We believe both incidents were a result of another hen trying to get into the nesting box, with Plymouth already in there. 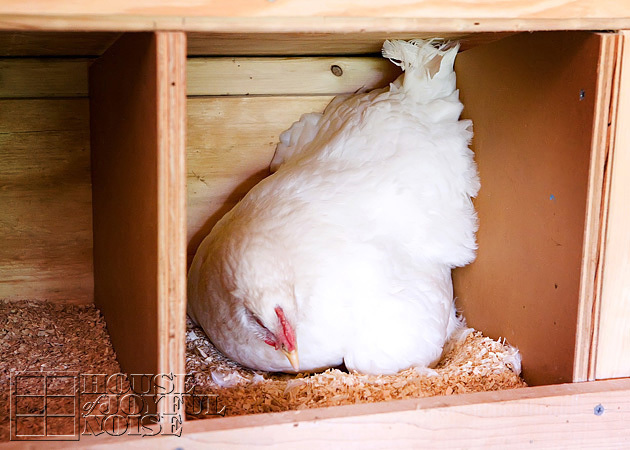 Whether they wanted to take over the nesting, or she and the eggs were in their favorite box they wanted to lay in….either way, there was not enough room for everyone. And with the likely struggle between the two, someone stepped on and cracked an egg. We were down to 5. It was day 21, right on time, that Michael came home for lunch, went out to see if anything was happening under Plymouth, and told us over the house monitor, “I hear peeping!”. 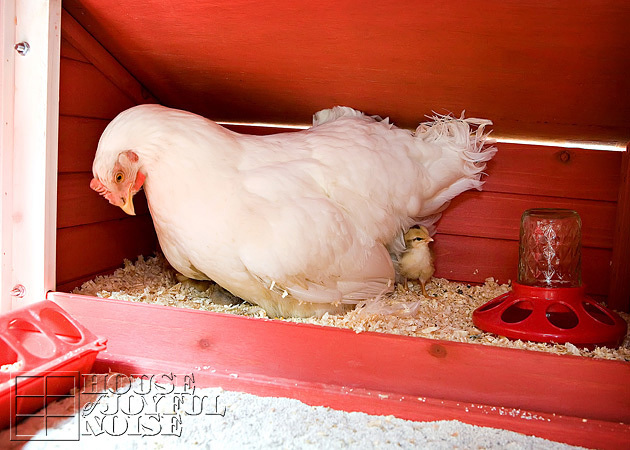 He lifted up Plymouth, and there was the first hatched chick! 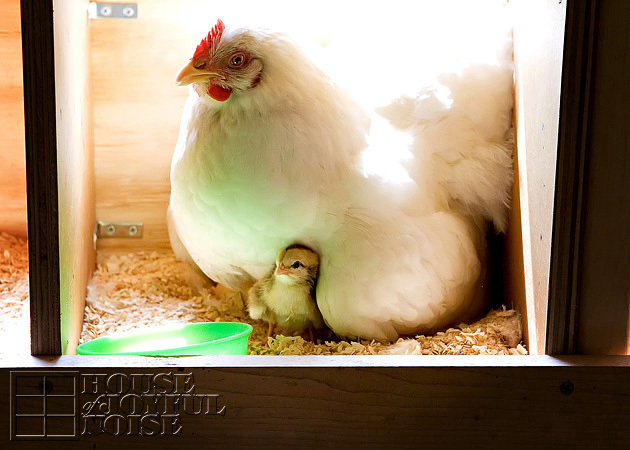 In no time, that chick was all dried off and peeking out from under Mama. 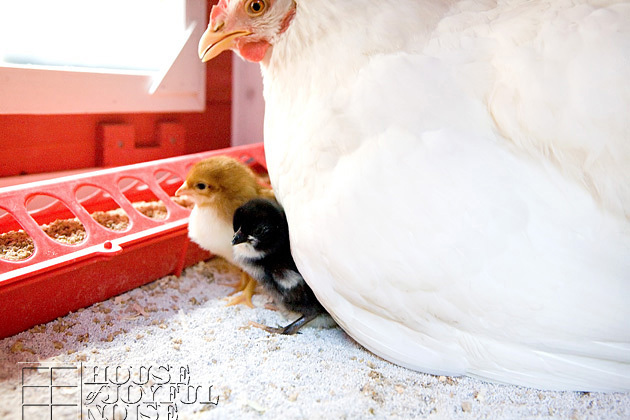 Before we knew it, two more had hatched. I had Michael or our oldest daughter getting photos for me. But I wanted so badly to get up there and take them myself! 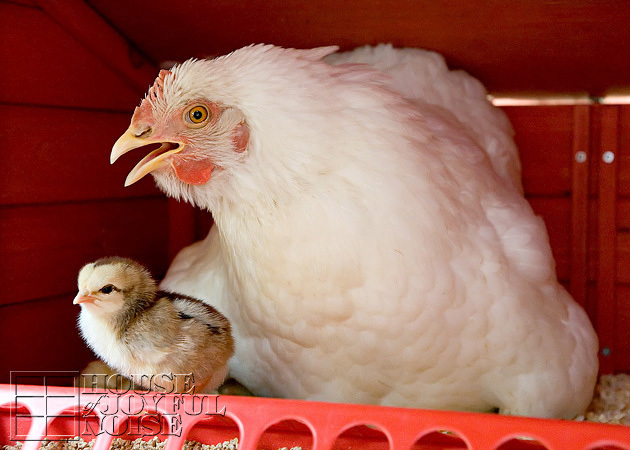 It was the next day that we decided to move Mama hen, her 3 baby chicks, and the 2 remaining eggs still expected to hatch, out of the big coop nesting boxes, and into the little brooder coop that we bought, which we had set up right in the big run. 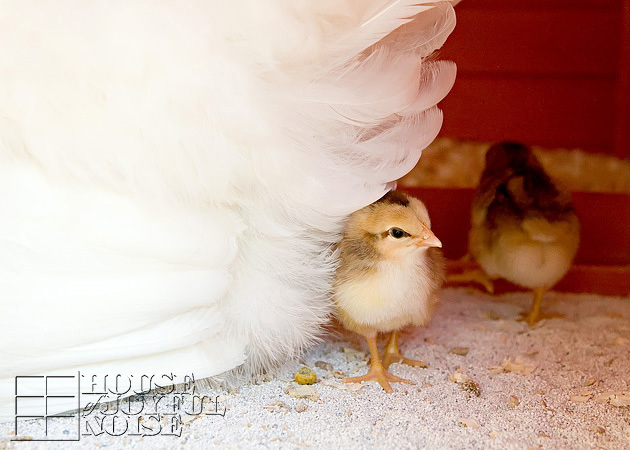 This way, the chicks would be in a smaller, safer environment with their residing Mama as they grew in the coming weeks, and yet still be able to interact with the other chickens, with the safety barrier. We did this knowing that completely removing them from the environment would really pose a challenge later on, trying to integrate the youngins into the flock later when it was time. Four chicks hatched at the time of this photo: one still to go. Still waiting. You can see that last egg under there. 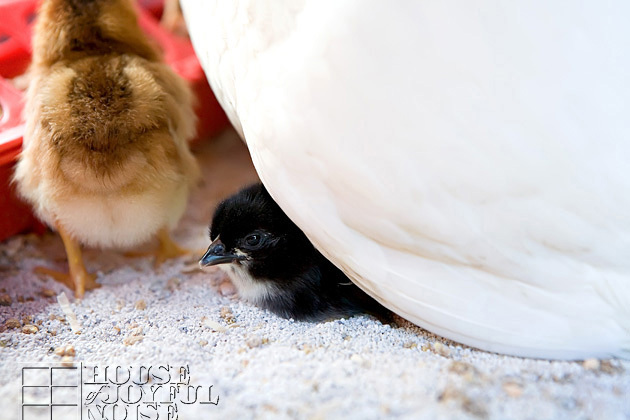 By later that day, both of the remaining chicks had hatched. We did move the brooder coop down to the deck in those first few daytimes, so I could watch, spend time with them too, and take photos. But while I was away in the house the triplets actually were able to watch the last chick hatch, from start to finish. 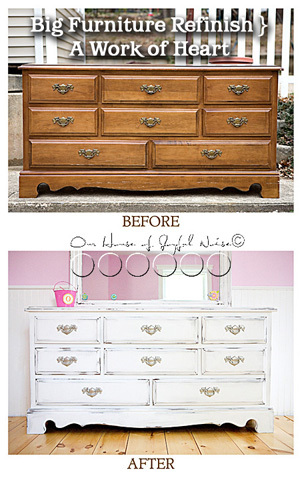 I would have *loved* to take photos of that process, but they didn’t tell me until it was all done! They wanted to surprise us, with the news that the last chick was here. 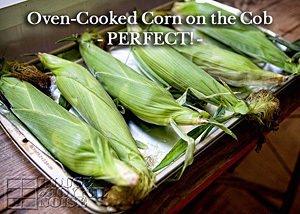 How….sweet, huh? Anyway, it’s a tiny little coop, and I really needed to stoop down to get photos, but I did what I could and did get some! The sweet black chick you see here, was the last born. It’s a mix of Black Australorpe and Welsummer. It’s a very special chick. I think I’ll have a post sometime soon, with the full story. And so those 5 hatched naturally and successfully, and we have been enjoying watching them grow, and pick up new skills so quickly. The brooder was moved back up into the run every night, and then for good after day 2 of the last chick being born. If you follow us on our Facebook Page, you may have seen a few photos and story-bits, as we are so amused with these little girls! (Hopefully, girls.) 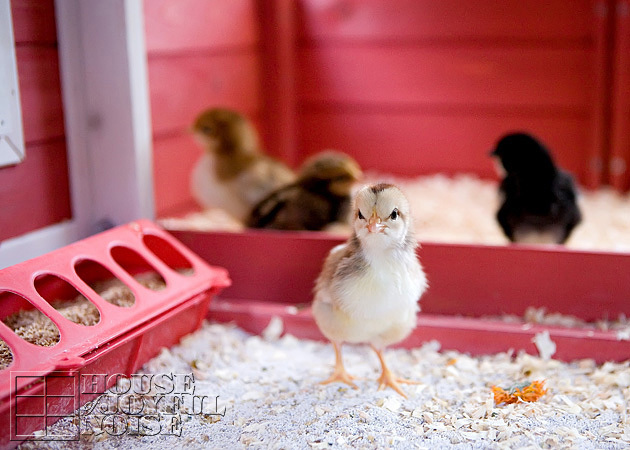 I initially was so concerned about the chicks getting out of the little brooder coop, and the steep ramp with such spaced steps. 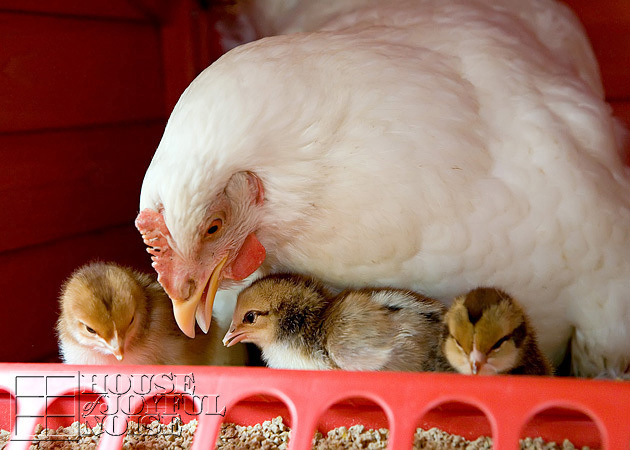 But I quickly realized, a Mama hen really does manage it all, and those little chicks are very capable, very quickly! Once Mama let them out, they just fluttered up and down the ramp, coming in and out to eat, drink, play or nap. We have all had such fun watching them. This is our third experience with baby chicks. There was the time when the kids were a lot younger, and we got fertilized chicks from the 4-H Club. 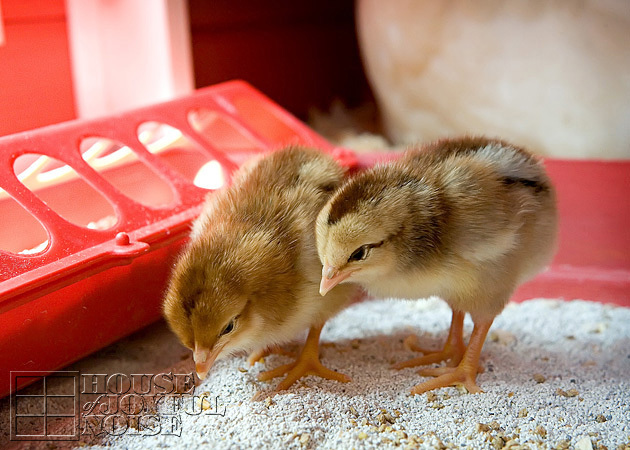 We incubated them, colored them (a fun science experiment, and safe for the chicks), and let them hatch. It was fun to see what colors they would be when were born! (See them HERE.) After those ones were a few weeks old, and their regular feathers began growing in, we were able to return them to 4-H as pre-arranged. Then there was our current almost 1 year old flock, which we ordered as one day old chicks last July. 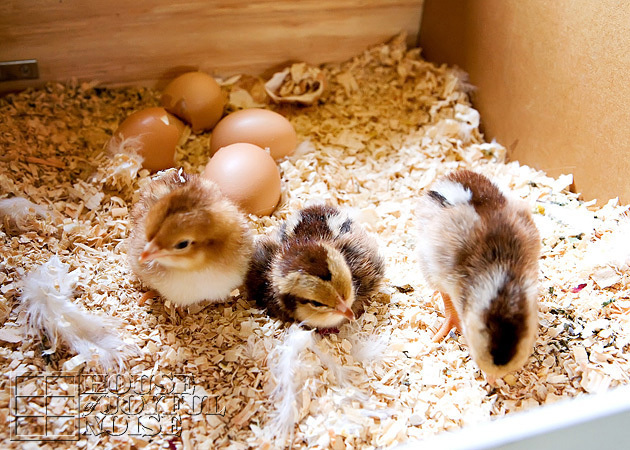 That was crazy because the brooder was a cardboard box in our house….we had to regulate the heat ourselves and clean up the mess a couple of times a day. 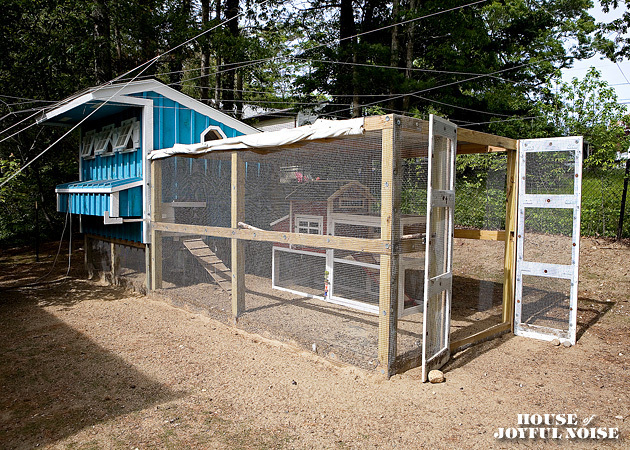 The coop was still being built, and they were in the house weeks longer than we ever anticipated! 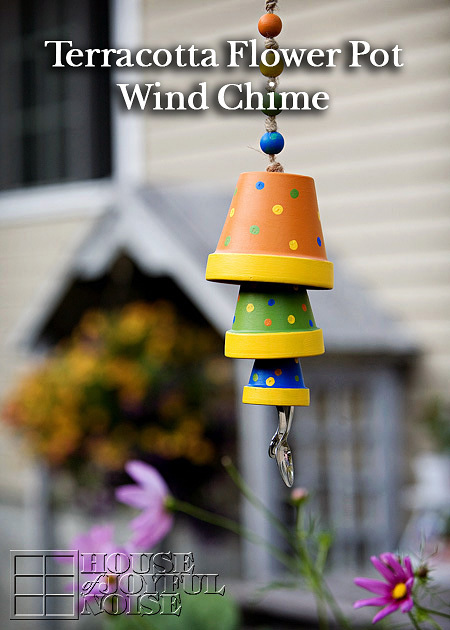 The peeping was sometimes deafening, and one eventually started to learn to crow! In the house! It was all so fun and exciting. 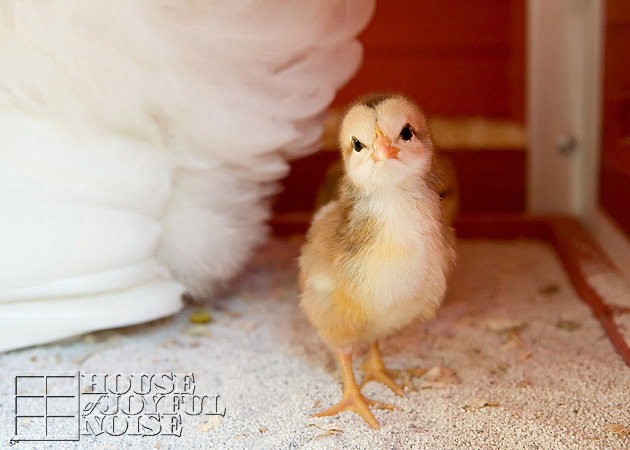 But….there is no doubt that of all three experiences, letting the chickens naturally hatch their own eggs and care for their own chicks, is soooooo much easier! Really, there is very little to do ourselves, if anything. As much as I have loved having chickens as much as I always knew I would, I love to watch the kids and Michael love them so much every day, too, and be so excited over every new thing that happens. Michael is as much of a kid as the the kids! It’s kind of cute, the way he gushes over them, if you ask me. If you’ve enjoyed these photos, there are a handful more, with some really cute ones, in this slideshow below. I didn’t want to overload the post. We can almost guarantee that some will melt your heart! 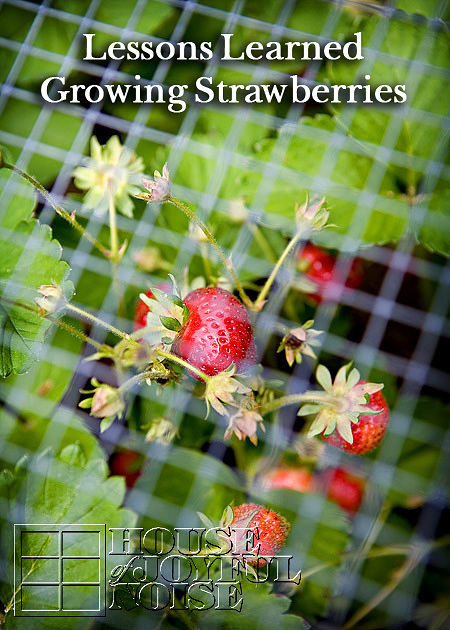 Of course, you can always watch them grow in photos, see little videos, and enjoy other great content we share, at our Facebook Page and/or on our InstaGram. We have not named any of the new chicks yet. However, my oldest daughter did convince me to do a little photo shoot for each of them as we did when our (now) grown flock were chicks and we first got them, with the white backdrop, to announce their names later. 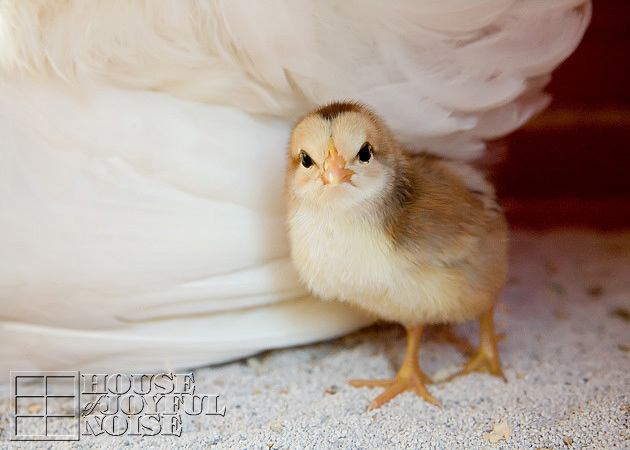 We are just hesitant to name them because, any rooster we learn is in the mix has GOT to go! And it’s so much harder to let them go after you’ve named them. I don’t know why that is. But we’ve learned the hard truth in that. There is something about giving them a name that really forms the connection, and makes them feel officially yours. So, we’re not sure what we are going to do about that, or when. 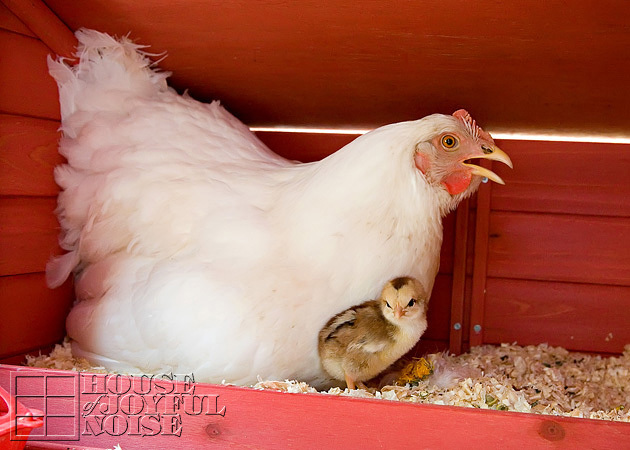 But we’ll be sure to keep you up to date, on all of the chickens and chicks happenings. Thanks so much for coming over and seeing our new little ones!